Already the impacts are obvious in the extreme north, where melting Arctic sea ice, drowning polar bears, and forlorn Inuit hunters are by now iconic images of global warming. The rapidity and severity of Arctic warming is truly dramatic. However, the Arctic, a relatively small, thinly populated region, will always be marginal in terms of its raw social and economic impact on the rest of us. The greater story lies to the south, penetrating deeply into the "Northern Rim," a vast zone of economically significant territory and adjacent ocean owned by the United States, Canada, Denmark, Iceland, Sweden, Norway, Finland, and Russia. As in the Arctic, climate change there has already begun. This zone — which constitutes almost 30 percent of the Earth’s land area and is home to its largest remaining forests, its greatest untouched mineral, water, and energy reserves, and a (growing) population of almost 100 million people — will undergo one of the most profound biophysical and social expansions of this century. LAURENCE C. SMITH is Professor and vice chairman of geography and professor of earth and space sciences at UCLA. 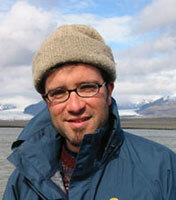 He studies likely impacts of northern climate change including the economic effects in the Northern Rim. [LAURENCE C. SMITH:] Like so many other cultural shifts, it gathered long, then broke quickly. At last the world — including a majority of people in the United States — has acknowledged that global warming is real. Changing the public's opinion was not easy. It took the work of thousands of scientists, painstakingly accumulated over more than three decades. Their findings were then steadily communicated to the world through massive synthesis reports in 1990, 1995, 2001, and 2007 by the Intergovernmental Panel on Climate Change (IPCC), displaying a level of organization unprecedented in science. These reports document the evidence, now overwhelming, of our new man-made climate. Pivotal to the public opinion shift were ardent "Third Culture" scientists — among them James Hansen, at NASA's Goddard Institute for Space Studies; Lonnie Thompson, at Ohio State University; Richard Alley, at Pennsylvania State University; and Mark Serreze, at the University of Colorado — with a talent for grasping the most significant discoveries and channeling them to the public through books, interviews, YouTube, and popular magazines like Rolling Stone These efforts at public outreach represented a significant shift in the culture of science. As a graduate student in the mid-1990s, I witnessed the widespread, if subtle, scorn directed at the remarkable astronomer and writer Carl Sagan by his professional colleagues for his efforts in publicizing his scientific work. But today, and especially in climate-change science, public outreach is part of the job and a cause for appreciation and emulation by scientific colleagues. Other events, largely unforeseen, also figured prominently in converting the public. The graphic horrors wrought by Katrina — regardless of that hurricane's cause — sowed national unease via millions of televisions and computer screens. The failed presidential bid of Al Gore in 2000 freed him to film An Inconvenient Truth in 2006 — and, together with the IPCC, he won the 2007 Nobel Peace Prize. The 2006 decision of Wal-Mart to embrace and aggressively market green technology reached millions more, including many who wouldn't be caught dead at an Al Gore movie. In my home state of California, Republican governor Arnold Schwarzenegger asserted, "The [climate] debate is over" — and from a scientific and public-opinion standpoint, he was right. The burden of proof is past, so what's next? The debate has, if anything, intensified; the line of scrimmage has simply moved downfield. Questions like "Is it real?" and "Is it our fault?" have morphed into "What will happen?" "Where?" "How fast?" and "What are we going to do about it?" Science may have led us to these questions, but our answers will reverberate far beyond science. At stake is no less than the global pattern of human settlement in the twenty-first century. So, what will happen? Here is what we know currently: First, the warming is just revving up. It is 90 percent certain that continued greenhouse gas emissions at or above the current rates will induce far ‘greater' climate change in the twenty-first century than we've yet experienced.1 In every plausible population-growth or greenhouse-gas-emission scenario for the next century (barring some as-yet-undiscovered nonlinearity in the climate system), basic physics dictates that Earth's climate must continue to warm, with global average temperatures rising between 1.8°C and 4.0°C (3.2°F and 7.0°F) by the end of this century.2 How high we go depends on how much carbon we choose to load into the atmosphere; the lower value is the IPCC's optimistic estimate, which assumes a stabilized global population and the adoption of clean-energy technology. The high value is the estimate based on unabated dependence on fossil fuels. If those temperature changes don't sound large to you, they should. Even the most optimistic number (1.8 °C) triples the warming we had in the twentieth century. Furthermore, thanks to the long life of greenhouse gases in the atmosphere and the sluggish response of the world's oceans, we are already "locked in" to much of that warming, regardless of what policy changes we enact. The global temperature increase to 2030 is all but committed, and even if we could cap greenhouse gas emissions immediately at 2000 levels, we would still experience about half the projected warming by midcentury. But over the long run, policy changes will have a large impact: only 20 percent of the projected 2100 temperature rise is currently locked in. At this point, it is still possible — through aggressive societal action — to blunt the warming. But we cannot stop it. The hotter temperatures will increase evaporation, drying soils and raising the frequency of drought, especially in two broad belts from 20° to 40° north and south latitudes — that is, in both hemispheres. The number of extremely dry days will increase sharply in the southwestern United States, southern and eastern Europe, southern Africa, and eastern South America.3 Water vapor in the air will also increase, in obedience to the Clausius-Clapeyron equation, which states that the water-holding capacity of the atmosphere must go up 7 percent for every 1°C rise. Because water vapor fuels weather systems, the frequency of extreme precipitation events — and therefore floods — will go up right along with it. Deadly, power-sucking heat waves — like the killers in France in 2003, the United States in 2006, and Japan in 2007 — will happen more often. Sea level will continue to rise (it's rising now, around three millimeters per year), the only uncertainty being exactly how fast and how high. Low-elevation coastal areas, including Florida, the Netherlands, island nations, and impoverished Bangladesh, will face inundation in the coming decades. If you saw An Inconvenient Truth or read climate-change stories in the press, you already know most of this bad news. Alongside more speculative notions about hurricanes and wildfires, they are the most widely reported scientific predictions for the twenty-first century. However, even these are not the starkest forecasts of our climate models. The most robust changes will sweep across the northern high latitudes, starting at about the 45th parallel running through the northern United States, Canada, Russia, and Europe. North of that line, the climate changes will be unrivaled on Earth. Temperatures will rise at nearly double the global average — driven mostly by milder winters — and precipitation will increase sharply as well. Already the impacts are obvious in the extreme north, where melting Arctic sea ice, drowning polar bears, and forlorn Inuit hunters are by now iconic images of global warming. The rapidity and severity of Arctic warming is truly dramatic. However, the Arctic, a relatively small, thinly populated region, will always be marginal in terms of its raw social and economic impact on the rest of us. The greater story lies to the south, penetrating deeply into the "Northern Rim," a vast zone of economically significant territory and adjacent ocean owned by the United States, Canada, Denmark, Iceland, Sweden, Norway, Finland, and Russia. As in the Arctic, climate change there has already begun. This zone — which constitutes almost 30 percent of the Earth's land area and is home to its largest remaining forests, its greatest untouched mineral, water, and energy reserves, and a (growing) population of almost 100 million people — will undergo one of the most profound biophysical and social expansions of this century. "Minus-forty" is feared and hated by everyone who has experienced it. The shutdown of human activity it mandates has been described to me by people from all around the Northern Rim — restaurateurs in Whitehorse, Cree trappers in Alberta, truck drivers in Russia, retirees in Helsinki. And while they express otherwise mixed opinions on the various problems and opportunities presented by recent warming, the one sentiment they all share is utter relief that minus-forties are becoming increasingly rare. northern Norway, Sweden, and Russia. But before you rush to Realtor.com to scope out acreages near Anchorage or Winnipeg, listen up: yes, there will be growth, but it won't happen everywhere. Like human expansion over the millennia, its direction will be shaped by the choices we make and the previous imprint of history and geography. In his book Collapse, my UCLA colleague Jared Diamond scours human history to identify five prime factors that determine the likelihood that an existing society will fail: environmental damage, loss of trade partners, hostile neighbors, climate change, and how a society chooses to respond to its environmental problems. Any of these, alone or in combination, can trigger a society's collapse. Turning the question around, what makes a new society likely to successfully establish itself ? First and foremost is economic opportunity, followed by environmental suitability, opportunities for investment and trade (implicit in this is military security and the consistent rule of law, without which investors balk and trade will not be stable), friendly neighbors, and willing settlers. At present, these requirements are met only to varying degrees around the Northern Rim. Abundant economic opportunities exist in the form of commodities — fossil fuels, minerals, fish, and timber — and, indeed, their exploitation currently generates most of the Northern Rim's gross domestic product, the second contributor being government services. The neighbors are generally friendly; relative to the rest of the world, all eight Northern Rim nations have low internal unrest and share amicable borders — though Finland frets over its long border with Russia, and Russia worries about the United States and (especially) China on its thinly populated eastern flanks. Nonetheless, there have been no serious military incursions among the eight countries since World War II. Seven of them (Russia is the exception) enjoy the most stable political systems and rule of law in the world. That leaves environmental suitability, trade, and settlers. It seems likely that climate warming will blunt the most significant environmental limitation — brutal winters — currently restricting human expansion in the Northern Rim. The warming will also ameliorate other problems, such as the short growing season, and create new ones, such as pest infestations, but these are secondary to the impact of milder winters. So climate change, one of five key factors known to collapse past societies, will actually engender them in these northern latitudes. Still remaining are trade and settlers. All else in place, these factors depend mainly on markets, infrastructure, and demographic trends. While commodity prices are famously volatile, over the long haul (this century and the next, for example), it's a safe bet that the world's demand for water, minerals, energy, food, and timber will remain high. But demand per se does not create trade; there must also be infrastructure, without which commodities cannot get to markets, and settlers, without which there is no labor. And sufficient settlement requires domestic population growth, immigration, or both. Since strong contrasts in both infrastructure and demographic trends exist around the Northern Rim today, I expect them to shape the geographical pattern of northern human expansion. Unless, that is, we jolt the system somehow — which is exactly what we did twice in the last century, which led to the geographical contrasts in the first place. The Northern Rim has long been resource-rich and population-poor, an irresistible siren call to its central governments. Over the years, their efforts to increase infrastructure, population, and economies have been motivated by different ideologies and have had mixed results. Also, their treatment of aboriginals has varied hugely, with U.S. and Canadian groups faring best in recent years, followed by those in Scandinavia and lastly Russia. But all this pales in comparison with two enormous choices made in the twentieth century — choices that utterly transformed the footprint of humanity in the Northern Rim. They were the U.S. Army's decision to occupy Canada during World War II and Joseph Stalin's decision to create the Gulag, a string of forced-labor camps and exile towns across Siberia, between 1929 and 1953. The underlying motivation for Stalin's murderous prison-camp system ran far deeper than the silencing of political malcontents. It was nothing less than a forced settlement of his country's remote territories — then sparsely occupied by aboriginals — with ethnic Russians. The Gulag was responsible for some of the worst atrocities of modern history, including countless deaths from starvation, exposure, exhaustion, and outright murder. But as a forced-settlement tool, the program was a resounding success. By the early 1950s, the camp population stood at 2.5 million people, most of them political exiles or people condemned for minor crimes.5 They labored in mines, cut timber, and built roads, railroads, and factories. If they survived their sentences, ex-prisoners were legally prohibited from returning home. The towns grew huge, and by the end of the 1980s they were major cities, entrenched across some of the coldest terrain on Earth: Novosibirsk, Omsk, Yekaterinburg, Khabarovsk, Chelyabinsk, Krasnoyarsk, Noril'sk, Vorkuta. Mother Russia had urbanized Siberia. Today the future of these cities lies in doubt. Their locations are arbitrary, selected more for quaint socialist ideals, such as taming nature and Engel's dictum (the idea that industry should be uniformly distributed across a country), than for the pragmatic requirements of economic viability. They exist in places that don't make sense: in harsh environments, at long distances from one another and from trading partners, precariously linked by absurdly stretched infrastructure that requires deep subsidization from Moscow. The burden socialist planners placed on the Soviet economy by founding these cities in such inhospitable locations was so great that in their book, The Siberian Curse, Fiona Hill and Clifford Gaddy argue that "the cost of the cold" deeply saddled the Soviet economy and helped bring down the USSR in 1991. After the Soviet collapse, the subsidies disappeared. Throughout the 1990s, the giant Siberian cities emptied out faster than Detroit in a bad layoff year. Today there are some signs of population stabilization, and limited prosperity is trickling back with high oil prices. A second, wiser attempt at massive infrastructure establishment in Siberia may well occur in this century, as Russia and China eye its vast natural wealth. There are already early indications of this: Vladimir Putin has officially opened a 6, 200-mile highway between Moscow and Vladivostok — the longest highway in the world — and Russian military scholars have floated the idea of a "free economic zone" in Siberia's Far East, opening up the region's vast timber reserves to development with Chinese capital. But the population continues to drop, among ethnic Russians and aboriginals alike — a decrease compounded by high mortality, suicides, and grinding poverty. Any new human expansion in Siberia will require a considerable installation of infrastructure, a wiser settlement plan, abandonment or relocation of failed towns, and reversal of today's negative population trends. U.S. military personnel and contractors in Alaska alone. In northwest Canada, there was what amounted to a friendly occupation by forty thousand soldiers and civilian workers — a huge population infusion for such a sparsely populated area. The Canadian government watched from Ottawa as the United States transformed its country with the Northwest Staging Route, the Alaska Highway, the Canol Pipeline, and dozens of other projects.6 The imprint of the U.S. Army Corps of Engineers still shapes the pattern of Northern Rim human settlement and economic activity today. Aboriginal groups, utterly marginalized, saw their homelands overrun. In Canada they endured culturally damaging resettlement programs. However, since the early 1970s they have steadily regained control of their territories and mineral rights through legal action (land claims), now largely concluding. U.S. and Canadian aboriginals are forming blue-suit business corporations and strengthening their economic and political clout, and they have some of the highest population growth rates of the Northern Rim. If the American droughts continue, I and my fellow climate-change refugees will be unable to count on swarming across our northern border: all the good spots will be taken. So what does this tell us about the coming northern expansion? The United States and Canada have sensible infrastructure, working rules of law, and a fast-growing domestic population of suitable settlers. These two countries are well positioned for expansion. Russia, with badly placed infrastructure and a severely declining population, is not. Scandinavia, with its well-developed roads, ports, and universities, is already poised to benefit from the winter climate warming already in the pipeline. Lest you misinterpret this essay, let me make something absolutely clear: the transformation I describe is a conversion from land that is hardly livable to land that is somewhat livable. There will be no northern utopia. Global society will be far better off if we can stay where we are, enjoying the much larger and friendlier land mass between about 50° N and 45° S. The 23.5° axial tilt of our planet dictates that there will always be darkness and cold at higher latitudes, even if greenhouse warming causes February in Churchill, Manitoba, to warm up to, say, February in Minneapolis. And the die is not fully cast: yes, we are locked into a large amount of warming, but not (as of yet) so much that we must all migrate to Yakutsk. Just as Stalin shaped the Northern Rim with prison camps and the U.S. Army shaped it with airstrips and the Alaska Highway, our choice is whether to shape it with sensible, far-reaching plans based on the IPCC's optimistic or pessimistic greenhouse gas emission scenario. At best, the Northern Rim will become tolerable, not a paradise. I do not advise buying acreage in Labrador. First published in What's Next: Dispatches from a New Generation of Scientists, Edited By Max Brockman ; New York: Vintage Books, 2009. Reprinted by permission of the publisher. 1 S. Solomon et al., eds. "Summary for Policymakers," in Climate Change 2007: The Physical Science Basis Working Group I Contribution to the Fourth Assessment Report of the Intergovernmental Panel on Climate Change (New York: Cambridge University Press, 2007), 13. 2 Ibid. "Technical Summary," 70. 3 Solomon et al., fig. 10:18. 4 F. Hill and C. Gaddy, The Siberian Curse (Washington, DC: Brookings Institution Press, 2003), 41–49. 5 Hill and Gaddy, 86. 6 See K. S. Coates and W. R. Morrison, The Alaska Highway in World War II: The U.S. Army of Occupation in Canada's Northwest (Toronto: University of Toronto Press, 1992).